I am taking my first MOOC (massive open online course). It is presented by the International Writing Program at the University of Iowa. The first week before I wrote my own assignment, I read an incredible piece by one of the other participants. In a thousand words she’d built a whole compelling and creepy dystopian world, and made me care about the mother and daughter who lived there. It made it hard for me to write my own assignment. I couldn’t stop comparing my own writing to hers. It troubled me. I loved her piece for itself and for her sake, for the evidence that she’d so clearly entered in, had experienced the magic of fiction unfolding. It thrilled me for her. But I let it make my own writing feel pale and weak. It couldn’t stand up to hers. I am rusty at writing fiction, and in the first two assignments that magic hasn’t happened for me yet. But I haven’t given up, so that is something to feel grateful for, and maybe a little proud, too. I am being a writer. And it reminds me, too, that being a writer does not often match up with the easy, romantic image we have built. It means writing and even submitting work that is only the best we can do in the time allowed. It means envying a classmate for writing “so much better” than we can. It means slogging through a writing task when our critic keeps yelling at us to stop, to give up, to throw it all away. To take up house painting instead. But it also means getting to study craft, to listen to other writers talk about how they write. It means having a chance to practice even if it doesn’t always feel good, knowing it is all part of the writer’s journey. And it means always having the pleasure of reading the work of other writers, of being moved by their words, waking up. I read another piece by a classmate in this MOOC that will stay with me always. Her story doesn’t just lead me into the reality she builds or give me a glimpse into her characters. It changes my way of looking at the world. Hers is a conversation between two sisters in the spirit world visiting their family’s Day of the Dead altar. I’ve always thought about all these people making the offerings themselves, the favorite foods, the photographs. I’ve built my own altars, talked to my own dead. But until I read her piece, I never pictured these gatherings in the spirit world, how they might look forward to this event all year. Now I can see them whispering in anticipation, gathering to watch the altars being built here in our world. It brings things together for me, makes this a complete whole in a way it never was for me before. So, thank you, fellow writer. Y feliz día de los muertos a todos. There are two white crowned sparrows, winter migrants, and two house finch in the tray feeders. The doves scattered earlier, probably a circling hawk. Now we have a bit of quiet in the courtyard, only the occasional melodic sounds from the sparrows and some goldfinch conversations coming from my neighbors’ tree. I love these daytime forays of the white crowned sparrows. Last year I almost never saw them. But I relished the sounds of them scavenging the fallen birdseed just before full light or in the late, late dusk before full dark. They are tender spirits, I think, quick to seek cover. Maybe the growing bougainvillea in the corner is making them more bold this year? Knowing they have a nearby retreat? Today I am battling a cold, so I am subdued, a running underlying sense of wanting to be asleep. But I feel good, too. The volunteer marigolds, over a hundred, I think, are in perfect time for the Day of the Dead. This morning their bright orange pops in the gray day. Halloween is the pagan new year, too, one of the eight main pagan holidays, a day when the veil between the worlds thins. I feel it all today in my courtyard, heralded by the hundred neon marigolds, by our migrating sparrows, by the absence of the sun. There are times when we can feel the earth turning, pivotal points like now with these looming holidays. We move more fully into the moon-dominated part of the year, from the fall equinox until the winter solstice. It feels perfect for my life right now, for my writing work, my healing, this turning inward that comes with the seasons. And it makes me even more grateful for the gift of extra time I’ve been given (regardless of the loss of income). The doves come back now in twos and threes, and the courtyard becomes busy with their steady pecking and their constant flutter. But if you listen hard, underneath their sounds you can hear Guy Gavriel Kay’s weaver at the loom. Do you hear her? The clack of the loom, the sound of the shuttle as we near next week when the veil between the worlds grows thinnest? And when you open your mouth, the air tastes like magic. 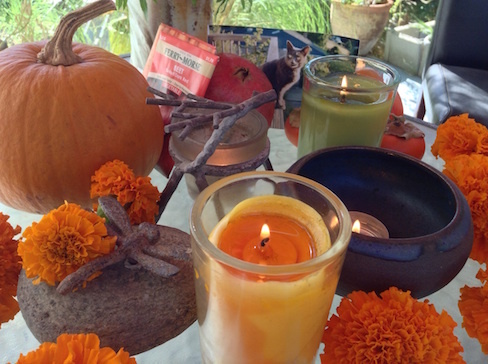 My day of the dead unfolded without effort, my altar growing little by little over the past week, my ritual organic and unplanned. I bought a big bunch of orange marigolds at the farmers market, and yesterday I plucked them from their stems, added them to the altar. Now it is a living, breathing thing beside me, candles at the heart of it. I wish I could let you see it the way I see it. The changing light adds a kind of sharpness, a clarity. It makes the colors dazzle, the flames dance. Every time I look at it it makes my heart dance, too. I have a big grin on my face, and I feel so lucky I could burst. And the smell—that spicy, earthy scent. I won’t need food if I can just keep breathing it in. Sunday in the late dusk I watered the plants here in the courtyard, went through the long list of my dead. They’d been coming to me bit by bit, but this time I started at the beginning, worked my way through each one in order, from my dog Grunt and my Oma almost 50 years ago to my cat Sofia, my newest dead. I ended up standing in the dark beside the glowing altar talking to each one, wanting them to know they are well loved and well missed, asking for blessings on them at this time when the veil between the worlds is thin, midway through these months when the moon holds sway. Today while I write a bee comes to grace the altar, touching each blossom in turn, messenger of the gods. Feliz día de los muertos. Happy turning of the wheel.